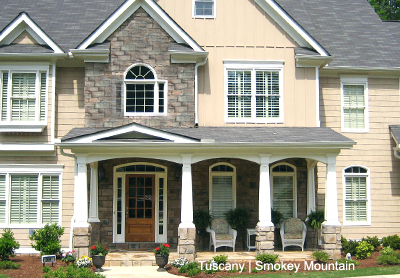 Tuscany Style stone is an equal blend of small, medium and large stones. This style combines Rubble, Stack and Ledge stone styles to create a unique look. This pattern lends itself to a uniform installation while providing a different look that blends different textures and thicknesses of stone. The Tuscany look creates a visual ambience of a formal and casual look with a rustic touch. This style is one of the fastest in growing popularity. Tuscany may be ordered in any color and is not limited in color selection to the colors displayed in this section. Tuscany should be ordered by square footage needed, allowing for 8% for waste.